How many applications and websites do you visit to get all the media and information you need every day? I think I personally use a dozen or more to get my daily dose of news, memes, comedy, and viral cat videos. I do most of this in the morning on my Android phone. Anything I do on my phone needs to be lean and fast, as anything that is not can be a tedious experience. My phone is pretty nice, but the content I seek can be taxing, as much of it is streaming video or graphics-intensive. I also like to keep my phone lean. I don't want too many applications cluttering up my homepage and using up all my memory. One resource is the solution to all of this: MSN.com. Really. MSN has been recently updated and optimized for your Android 2.3 or later device. Just type “msn.com” into your browser on your phone and that's it. It looks fantastic. If you like the new Metro styling in Windows 8, then you will LOVE the way the new MSN looks and navigates. It is also very lean . . . you do not need a separate app for it as you use your existing browser. All of your favorite social sites are linked on the home page so you are just a touch away from all of your friends on Facebook and Twitter. Links to your mail, maps, and even Skype are all there by default. And, of course, all the news you can handle is there, easily navigated to using left to right and up and down touch scrolling. 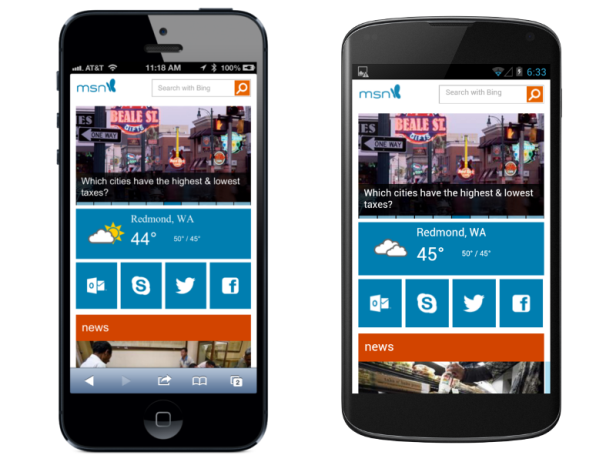 The new MSN experience is tuned for touch navigation and optimized for your mobile phone or tablet. As a result, it is also lean and fast, which is music to my ears. There is nothing worse than bloated resources on your mobile device. Streamline your web consumption and navigate to MSN.com on your phone right now. You will love the new experience! Check out the new, faster MSN here!